If you want to know how come I ran the race and how I trained for it, you can find the first part of the story here. If you’re only interested in race day, stay tuned it’s coming for you. Be warned , this is a long story. The 20km of Paris is a HUGE race that takes place every beginning of October in Paris. 30 000 people are running it. 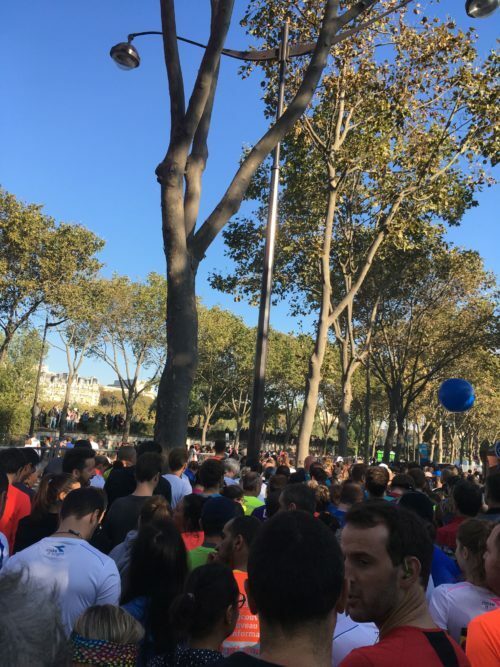 Fun fact , the race is very similar to the second half of the “Paris Marathon” . The race takes place in the western part of paris and the bois de boulogne, and the race start is conveniently 15min away from my flat. All of the above reasons made it easier to wake up on Sunday morning to race it. Sunday morning I woke up bright an early at 8. AM ( yes you read that correctly). The race did not started until 10 , and my sas was only starting at 10.40 AM so I decided to soak up the time at my flat. Just after waking up I ate breakfast which was 2 toasts: one with peanut butter and another with an egg and a lemon juice. 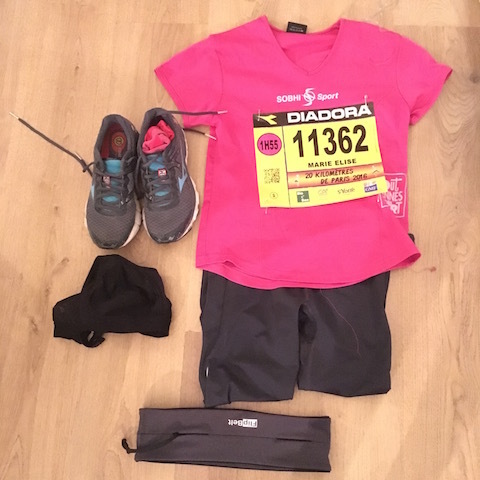 Then I got ready , did all the pre-race business and started freaking out about the distance I was going to run later in the morning. Around 10 AM me and the boyfriend took the subway and in all the stress and excitement I forgot my watch at home. We arrived around 10.20AM on the site, passed the ( non existent) security … and arrived in our SAS at 10.30AM. We only waited 10min in the cold, that was very well calculated, yeah meeee for not waiting hours. The crowd was happy, the sky was very blue and the sun was shining. I felt good, even though I was a little scared . But I must say I felt mentally able to run those 20Km today. At around 11 AM I crossed the starting line and we were gone. First, I thought I would do part of the race with the boyfriend. Little did I know that around 50m after the start he would wave goodbye and go running as fast as he could. Ha, no running buddy for me, but I had a good playlist after all and all the other 30000 runners with me. The first 2km were uphill so I ran but not as fast as I could up the hill, let’s not break those legs at the start. Then I settled on a good pace for me, 6:15 min/km for the next 10km. I had never ran more than 13km so my plan was : run at the same pace until km 15 and then do what I can until the end. I knew inside me that If I could run until the 15th km I could easily finish the race. At Km 3 Two friends were waiting for me in the bois de boulogne. It was so nice to see friendly faces supporting me ! I knew that after that I would be on my own for the next 10km . A lot of those km where in the forest and kind of flat/ downhill. I felt very good there, tried to maintain a steady pace of 6:15min/km and did not push myself to much to be sure I finished. Km 5 to 13 were pretty great, I felt confident, my legs were feeling great and I even decided to push myself a little after coming out of the woods. A lot of people were cheering us on and I even managed to pick up the pace to close to 6:00min/km which is a great pace for me ! Then we arrived on the quai de Seine, were I normally run on a weekly basis. Another friend was waiting for me at km 13 so I tried to run fast to see her. I waved and she ran for a little sprint with me. And then, I knew that I was in the unknown. Around Km 14 the first tunnel arrived and from there on it was rolling hills until km 18. OMG, rolling hills in the second half of the race, that was so difficult. I tried to let myself go as fast as possible on the downhills and tried to walk up the hills without getting too tired. But after the 15km I really realized that my legs were kind of dead. they were screaming to stop but I was so happy to race the 20km that I was continuing in my head. And really, I was running in my head , but I think my legs were only walking now , so funny. Anyway, my pace suffered a lot during km 14 to 18 ( around 7:00 to 7:30 min / km). Then, at the 18th km we were on the last leg of the race. Deep inside I knew it was done and I kept thinking, it’s not long now, only a matter of 10minutes keep running you’re doing great . Haha the mental games you do when you’re running. Just after Km19 I saw the 2h05 pacer and I though OMG I ran that fast and just like that I followed her and actually ran for 200m but then my running app told me I did a 2h10 20km and I thought that maybe the pacer had gone a little slower than she should be. Anyway, I could see the finish line now, and I thought that maybe I could sprint those final meters. People were cheering me on, but nope , that wasn’t happening lol. I was just thinking, you only need to cross the finish line and it’s finished. And I did !!! 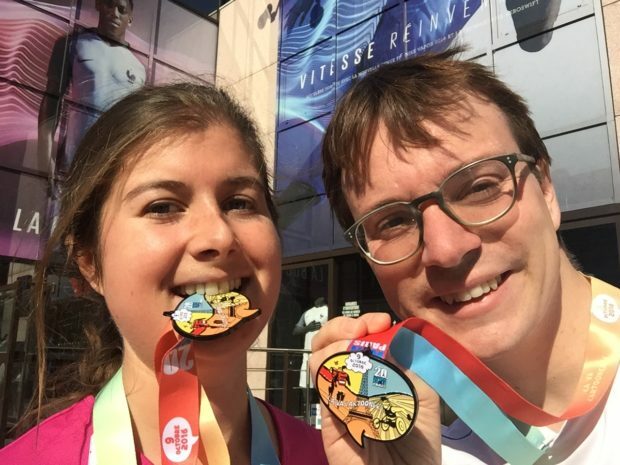 I finished the 20km of Paris in an official 02:13:21 !!! I am so happy I did it 🙂 and didn’t give up even with the lack of training ! My time is clearly not very fast but I am very happy of myself I ran it faster than a lot of my runs which means I actually raced it :). And it made me confident that I can push myself to do even better next time ! In case you’re interested the boyfriend ran the whole thing in 1:47, quite quicker than me :). It’s so rewarding to know you can actually run such a long distance. I feel so happy now with running and I want to continue with it even if a week ago I thought that I would stop all running activities right after the 20km :). So, If you don’t know either or not you can run a half/marathon/ 20km . Yes you can, it’s only willpower. I run like a turtle but I ran it anyway, and you can do it too. Did you ran a “long distance” run already ? What’s the longest run you did ? Did you felt proud after running a race ?